Nothing says Christmas quite like a Christmas Wreath on your front door, on the front of a building or the side of a barn. A wreath is a warm welcome to everyone. What a beautiful hello to Christmas carolers, your weary travelers, and the next door neighbor. Our unlit Christmas Wreath is 24 inches from tip to tip. This means when your wreath arrives it will need to be fluffed. Our wreaths do come packaged compact to prevent damage in shipping. For further clarification: The measurement of 24 inches is from outer reach of the wreath tips to the outer reach of the wreath tips on the other side of the wreath. It is not a measure of the diameter of the internal frame of the wreath. This is an industry standard but we want to make sure that commercial and residential customers alike understand this term. Your wreath will arrive in a "compacted form" and you'll have to fluff it up thoroughly to achieve that tip to tip measurement. 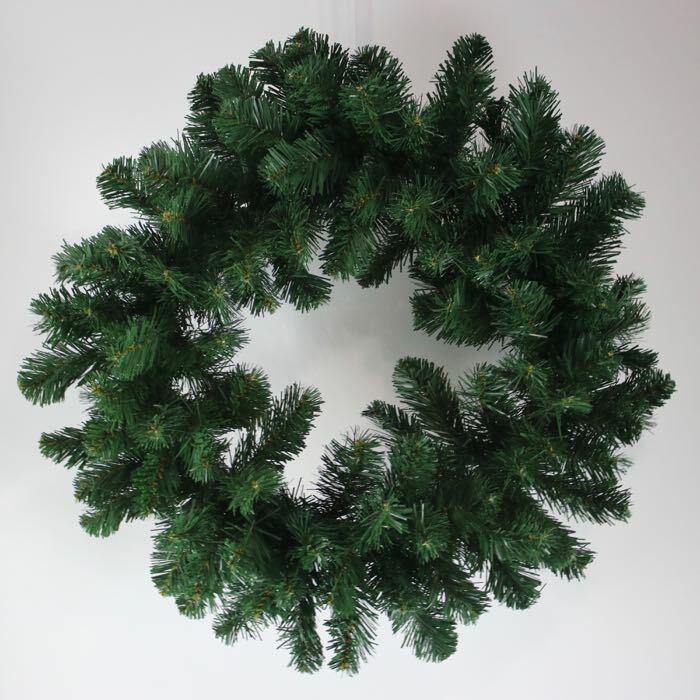 This is a very nice wreath..The quality is comparable to an artificial tree that you would put up for xmas. It has a pretty study support ring. There are plenty of branches if you want to "fluff" them out. I bought some teal lights and a bow to decorate the two of them. Looks great.. I should probably buy 2 more to match the 2 that I already have.